"I wish all eight of my sons had gone to fight in the mountains." ~ Xaje Artuget, somewhere in North Kurdistan. The Canadian Jeanette Tulluy, who was arrested Aug. 31 on charges of prostitution, has described her stay in prison while awaiting deportation as "horrifying." She said she and the other detainees were packed into one room, which included a disturbing number of children. She said the room lacked chairs or desks, so people were forced to either sit on the floor or on the beds. Tulluy said although many people were forced to share beds, she had her own. Tulluy said she could not sleep because the lights were kept on until early hours of the morning and because of the constant arguments and noise in the holding facility. "Everyone is so stressed, there is no hope," she said. "We were fed very little. Sometimes they would give us a tiny piece of bread and say "Here's your meal' but that's not a meal. It's as if they're leaving people to starve to death. You're allowed to buy food but you get very little for how much you pay. Everything is dirty here. They treat you like dogs. The police even tell you that you'll be treated like a dog or an animal." Tulluy said she was not afraid of the women she was detained with, but rather she feared the police. "When I was first arrested, a female police officer slapped me. And it wasn't just that," she said. "Other stuff happened as well. After I was brought here, they called me up at 4 a.m. What's there to do at four in the morning? They just stared at my face then sent me back to my room. But why? It's scary. You have no idea what they're going to do to you. One night a woman became ill. They sent a male doctor who started yelling at her. This really scared the woman and so she said "Don't help me.' All the women in here are sick, like me. We're all coughing. And that's not the end of it but this is all I can tell you. What happened to me is a crime but the stuff that's going on in this facility, that's an even bigger crime." Twenty-nine year old Engin Ceber died in the hospital where he was moved to after being tortured in the prison he was serving his sentence. The doctors were expecting him to die anytime. Ceber’s lawyer Oya Aslan said they were going to have an autopsy to determine the details of the torture. X-rays of torture victim Engin Çeber show he was beaten on the head and back, causing fatal internal bleeding, said the head of the Turkish Doctors' Union, or TTB, on Thursday. The 29-year-old Çeber, a leftist activist who was arrested at a protest rally held for another activist who was paralyzed by a police bullet, died in hospital from injuries sustained by alleged torture in a police station in Istanbul's İstinye district and the Metris Prison. Çeber was detained with three other demonstrators. TTB President Gençay Gürsoy, in a press conference, showed reporters Çeber's X-rays and said the activist's death was not caused because of a few bad apples but showed a systemic problem. "Torture is not a personal matter. Torturers are not psychopaths. They are just like you and me, who play at home with their children. Pathological torturers are very rare," he said. He said the cause of death was injuries sustained from a blunt object. Gürsoy commended the justice minister for apologizing because it was a first in such matters but argued it was not enough. He also said some doctors were involved in the death of Çeber, noting that a doctor ignoring or tolerating the torture of a human being should be penalized in the harshest possible way. So, this really isn't news; it's been going on forever in Turkey and the AKP is just continuing a long tradition. For the first time since his abduction to Turkey in 1999 Abdullah Ocalan, founder of PKK held in strict solitary confinement, has been physically tortured and openly threatened with death. As his lawyers told the press yesterday in Istanbul, Ocalan has been dragged by prison personnel to an adjoining room, forced to the ground by three persons while his cell was ravaged. When he protested against these brutal measures, he was explicitly threatened with death. Ocalan has been held under isolation conditions that is defined as torture. He is the only prisoner on Imrali Island, guarded by 1000 soldiers. Council of Europe's Anti-torture committee (CPT) has denounced his imprisonment conditions harshly in its four previous reports and up to the present day. Oh, we don't even want to think about what will happen if something happens to Apo. I mean, if the Ankara regime thinks things are bad now . . . Indeed, Kurdish support for the AKP has been fading ever since the government yielded to army pressure to resume cross-border operations against the PKK in northern Iraq. Maybe AKP's Injustice Minister will apologize to the Canadian prostitute. It's the only democratic thing to do, right? AKP is actually introducing many democratic solutions to decades old problems. Solutions that were not there in the 90's. You know these developments and improvements. However these developments and improvements do not work for you. Because you want blood to spill. So you just lie about these and spread lies that are 180 the other way just so you can balance their effect. You spread your own propaganda screaming "nothing changed" , "it's all back to 90's" by posts that actually has nothing to do with the effort. with truth. Never before has a justice minister apologized for torture. Never before was there a kurdish broadcast on TRT. Never before did the eastern regions receive so much attention. And you're just being unfair to AKP by portraying them in your own propaganda ways becase AKP being democratic, making progress towards democracy, , giving rights to Kurds (which you claim to ask for but yet you actually do not want). AKP paying attention to the Kurdish reality, does not work for you. you want some other things than Kurdish freedom in Turkey. Did you see the welcoming party for Erdogan in Amed today? Beautiful. Now they're going to allow 12 hours of Kurdish-language TV (all Turkish propaganda, of course). The AKP are staring down the barrel of an election slaughter in March, and they're scared to death. you mean the stores who closed down that day because of threats by PKK tyrants that if they were open they'd face the consequences? that's not a protest, but turkish democracy is open to that as well. turkish e.t., we waited for 'democratization' but it disappeared into thin air. My opinion is that the PKK's seven year cease-fire initiated after Ocalan's arrest could have developed into a permanent cease-fire had it not become in Turkey's strategic interests to resume military action and propaganda against the PKK due in large measure to America's invasion of Iraq which created the possibility of a Kurdish state in the region and which radically changed the dynamics of how the Kurdish question could be "solved" in Turkey. American disturbance of the regional status quo has definitely unified the Kemalist and AKP strategy vis a vis the Kurds. "AKP is actually introducing many democratic solutions to decades old problems"
"Never before was there a Kurdish broadcast on TRT"
Allowing Kurdish language broadcast was past the Turkish Parliament in 2001 by the DSP+MHP+ANAP coalition (in fact AKP voted against the Kurdish language rights at the time). After 7 years Kurds can only have 45min a week broadcast in Kurdish. "Never before did the eastern regions receive so much attention"
Ohh yeahhh, your islamist fascist PM ordered to kill wheatear the woman, children, old or young to security forces of fascist Turkey. He has created a lot of beggars (once every four years given rice, sugar and bread to his followers). "You spread your own propaganda screaming "nothing changed" "
No one is saying nothing changed. Things are getting bad to the worst. Turkey is becoming an Islamic state with no tolerance to minorities (Kurds, Alevis, Yezidis, Armenians etc,). Your Islamist fascist PM trying to bring OHAL with super empowers to the governors. 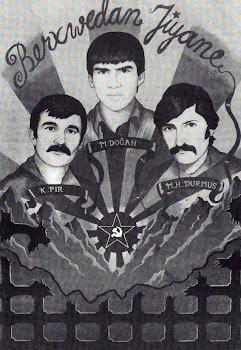 During the 1990 when the Turkish fascists crossed the South Kurdistan Border, it was treated shock but know fascists bombing South Kurdistan every single day. Only thing is good about the Islamist AKaPe years that the Kurds are very close to become independent state because of extreme harassments by the fascist and islamist Turks. Islamist AKePe just a week ago from the Erdogans mouth said "They have done everything that the army asked from them and they will continue to do so" what kind of civilian democracy is this? Stop fooling yourself you fascist turkish e.t. In what kind of democracy the PM of a country orders to kill civilians. "you want some other things than Kurdish freedom in Turkey." Where do you think we are you fascist Turk! May be in Turkey where everyone have their own secret agenda (PM and President being ultra Islamist but pretend to be light islamists and pro-democracy. Turkish generals appear to be patriots but in reality would do everything to kill his own people). Turkish e.t. grow up and try to get rid of your fascist mentality where you thing the state issues are taboo and sacred. Hamo clean up your mouth a bit. There are different levels of "broadcast rights"
we need a clear definition. My clear definition was "kurtce yayin tasarisi kabul"
This news piece is from May. It was actually AKP that STOPPED ohal and giving the military more power. Erdogan only says he supports the military as propaganda. The number of demonstrators in Amed is only near 5000/10.000 or more.. not much. "Hamo clean up your mouth a bit." I brush my teet at least twice a day and use mint mouth wash to rinse it which is recomended amound by the most dentists. I am not going to clean it again because you said so. "This news piece is from May." Yes, May 2008 which is lagging 6 years of initial changes in the constitution on 2001 regarding to use of Kurdish where islamo-fascist AKP voted against the use of Kurdish language and even voted for hanging the Kurdish People's Leader Abdullah Ocalan (this is exactly what they are trying to do now). This is not a change it is a small ammendment which show the unwillingless of islamist AKP's towards to use of Kurdish langauge. As your islamist PM said "Even if independent Kurdistan declared in Argentina still Turkey will oppose it"! Why? Nobody know. If you really think this islamist administration done anything good towards to Kurds then look at the reseption he got in the capital of Kurdistan just a few days ago. If you think these kind of uprisings only happen in Kurdistan then wait a little while longer. Trust me if your islamo-fascist PM carries on behaving this way whole Turkey will turn into Kurdistan. "...2001 regarding to use of Kurdish where islamo-fascist AKP voted against..."
can you send me a news link on these in 2001? Wrong, Erdal. AKP has instituted it's own OHAL, and that report was before the world became aware of AKP's Kurdish policy. More on that policy, here. AKP's new OHAL includes murder of Kurdish infants. turkish e.t. as well as being fascist you are also one lasy Turk! I did send all the links yesterday but some how it did not appear. Do your own search in google. While AKP's vote on pro-hanging the Kurdish Leader Abdullah Ocalan is on a lot of sites at that time but only few sites stressing AKPs vote against the use of Kurdish language as being AKP a small minority party in the parliement. Do your own search. AKP voted against every single proposel or constitution changes regarding improving Kurdish rights in the Turk parliement during the CHP-MHP-ANAP coalition years between 2000 and 2002. I did my own search nothing came up. fascist turkish e.t. obviously your lack of knowledge on your own countries politics shows how much interest that you have on Kurds and Kurdish suffering. This is the news on voting in August 2002 regarding Sir Abdullah Ocalan where the AKP voted to hang him. You really need to dig it deep to find out news articles regarding AKP's opposition to use of Kurdish language during the 2001 and 2002 votings. As I said before at the time AKP was a minority party with few MPs. AKP voted against the "execution" voting NOT because they were against the removal of it, but because it was not being done by the constitutional change, to leave room for clear decisions on what will come when that is removed. It was a vote against the process not the case. "Ölüm cezasının kaldırılmasını Parti olarak, Grup olarak biz de istiyoruz. " read: "...as AKP, we also want the law on execution to be removed..."
and Hamo anything you attribute to AKP after this is just your silly word-plays. Hamo my patience with your ignorance is grand, but please pick words on your reply to this carefully. you have confirmed everything that I said above. Indeed AKP voted for murdering the Kurdish People's Leader Abdullah Ocalan and this only this proves why AKP can not be trusted, regarded or relayed to improve everyday Kurdish lives. Another fact is that you have proved here was Lifting the Ban on learning or teaching the Kurdish language voted and accepted during the same period. After 7 years AKP still talking about whether Kurds should have a TV or not, after bloody 6-7 years Kurdish still can not be tought in the state schools. As your right that you are trying your best to defend fascist Turkish state here and not the AKP. I am sorry to say that but fascist Turkey and people like you have nothing on your side to defend. You can only be member of the UN security councel by using extreme bribes to unknown very small and extremely poor countries. Unlike with dignity and pride! I think after all the explaining i did above, you can still say "...AKP voted for murdering Ocalan..."
then you must be a politician. Because only politicians get stuck in the mere "words" and not see the actual truth. It is the publics duty to understand what actually is true. "AKP voted for murdering Ocalan" is not true. It is a lie. And by spreading this lie you are making a big mistake. You are making a big mistake by not seeing the progress made by AKP. I have dealt with a lot of ultranationalist Turks but I think you are even more stone-headed then them. Hamo it is not easy to start "kurdish education". It requires major effort and arrangement of resources. I'm not sure what you mean by "kurdish taught in state schools" I believe you mean "kurdish education" but it is a very heavy weight... and I think Kurdish, Kurdish villagers, Turks and everyone else cares more about heat and water than Kurdish education in schools for now... and there are houses in Turkey without heat, water or electricity you know??? Islamo-Fascist AKP voted for murdering Kurdish Peoples Leader Mr Abdullah Ocalan in August 2002 and this is a fact! I don't think any Kurd can trust a political party who voted for murdering their greatest Leader. Islamo-fascist AKP have done nothing to improve democracy, human-rights or the peace in Turkey. Every single progresive legistlations were past prior to AKP administration by the DSP-MHP-ANAP coalition era. Unfortunately AKP did not and would not even bring to the practice the laws that were already passed.